Raimy informs Frank of new information she uncovered in the Thomas Goff case, prompting him to take action inspire of Satch's warnings. Meanwhile, Gordo and Raimy go out for drinks, where they have a strange encounter with Daniel; and Raimy struggles to adapt to life without Julie. If Raimy is in an airplane that Frank causes to never be built, will she then plummet out of the sky? 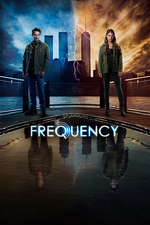 Yeah, this is the sort of time-travel-wtfuckery that makes my head hurt in Frequency, movie and series. If Goff disappeared from existence, there would be no reason for her to have been in that empty lot. And should her injuries have disappeared too? It's easier to shrug it off in the movie since it only really becomes an issue during the climax, and, it works so well emotionally I can give it a pass. I feel like it's going to drive me nuts eventually in the show though. So far, my retcon is "anything she had control of during the timeshift is part of her, and equally unaffected". The airplane would vanish unless she was piloting it (or had commandeered it and was directing the pilot's actions). Not every question is answered though. She's in the lot because she was pursuing Goff. But what if her car were different in this new timeline? Does it change in the parking lot like Goff disappearing? Would the keys in her pocket change or would she no longer have keys to her car? Most importantly... does someone watching from the bridge see her appear out of nowhere? Or do they see Goff disappear and they're stuck with both timelines too? Headcanon? Interpolation? Well, whatever it is, I'm pleased to be so close. The size of the "stable zone" is a really good question, and I'm hoping even a plot point later on. She wasn't in contact with her car, but it still came along with her into the new timeline. On the other hand, I would guess that his mother has been mourning him for 20 years, and there'll be nsigns of a struggle at his hideout. So, what someone would observe is a really good question. Would they observe anything? What would it be like? Raimy is reluctant to experiment, but sooner or later it has to happen just by chance.